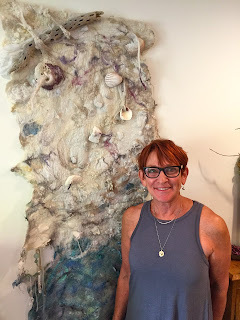 Ten like minded women joined me at the American Legion Hall in Los Alamitos, CA for three glorious days in March 2014 for a nuno felted seamless vest workshop. An unlikely place for a felting workshop but a very hospitable and comfortable place indeed complete with an attached bar! Fortunately none of us were driven to drink! The workshop was about making a simple vest pattern from one of our own garments. I taught how to size it up to account for the shrinkage during felting. And I made it so easy that no one had to use a calculator...go figure which is not what any one had to do, a pleasure I'm sure. Once we made the paper pattern, we transferred it to the plastic resist. We then spent the next few days playing with wool roving, silk fabric and other goodies to create a seamless felted vest. One felter, Alison, even used batts from her own Alpaca which felted up so beautifully. Everyone was so pleased with their finished vest and I couldn't have been more satisfied with the results. Not only were the vests so uniquely creative but they also were felted and fulled to fit each figure perfectly. 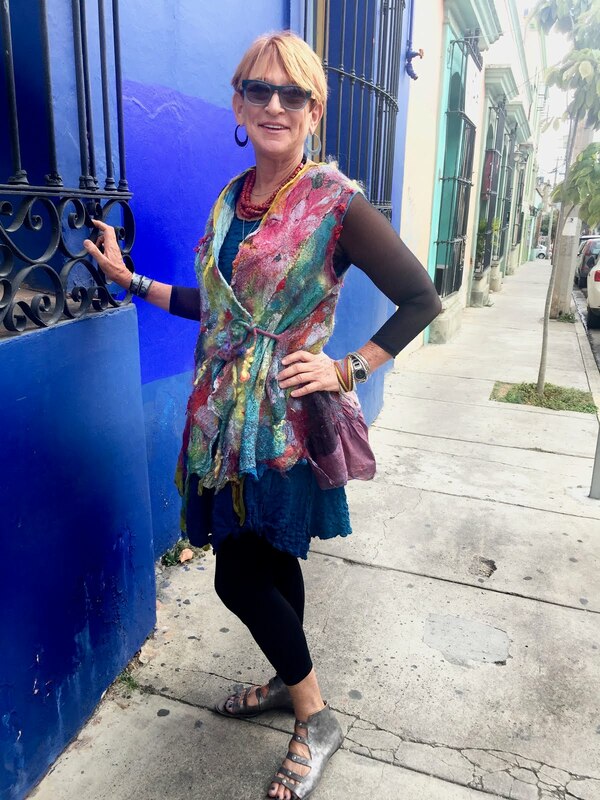 Check out the video below showing each felter creating their reversible seamless nuno felted vest and then modeling their beautiful creation. It's 7:42 minutes of joy! Click the bottom right icon next to the word Vimeo to enjoy it full screen. Nuno Felted Vest Workshop March '14 from Beth Marx on Vimeo.